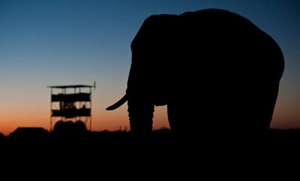 In an ongoing study conducted by Utopia Scientific scientists and contributing volunteers, in partnership with Stanford University and supported by the Oakland Zoo, elephants of the Mushara area of Etosha National Park have been monitored at several different levels to better understand their social structure, communication and health in order to apply this knowledge to improved care in captivity and ultimately to elephant conservation in the wild. Over 150 known bulls and more than 15 family groups have been cateloged and studied to understand the importance of long distance communication in both the air and ground and the influence and stability of hierarchies within and between groups, the interplay of hormones, hormone suppression and dominance, the role of musth in male society and reproductive health, as well as the influence of relatedness on male associations and bonding. Hormone profiles are linked to observed behaviors and behavioral trends throughout each field season in order to better understand the influence of social and environmental stress on individual behavior as well as at the population level. A camera trap was recently installed on the Mushara research tower in order to document group sizes, association patterns and musth duration throughout the year. Here is a link to a list of previous publications in the area of acoustic and seismic communication and vibrotactile sensitivity. Videos are also posted below to better illustrate the research. The first video shows elephants in typical seismic detection freezing postures while finishing their drink and leaving the waterhole as shown through a night vision camera. What is striking about the behavior illustrated here, particularly among those elephants already leaving, is the fact that several individuals are freezing almost mid-stride and in unison, including calves (Elephant Freezing Behavior). In order to understand the elephant’s ability to detect and respond to vibrotactile cues, we recorded an acoustic elephant alarm call made in the context of lions hunting and first broadcast it back to elephants to confirm the appropriate response (Acoustic Alarm Call Playback Video). Next, we transmitted these calls through the ground in a series of playback studies (Seismic Alarm Call Playback Video) and documented that elephants can indeed detect and respond to seismic cues as well as distinguish friend from foe. We are also looking into methods of mitigating conflict between elephants and farmers and have experimented with the use of estrus call playbacks transmitted through the air and ground to attract musth males and subadult male elephants back into parks safely and peacefully (Estrus Call Playback Video). Utopia Scienfitic scientists are now also looking into questions relating to long term memory, general cognitive ability and evidence of psychological states that resemble human emotion in these long lived, highly social large mammals. Until recently, emotion was a term that referred solely to humans. Today, scientists are looking for non-human models of emotion in order to better understand our own emotions. Cognitive functions, such as perception, attention, learning, memory, and motor control, are all influenced by emotion. Understanding the interaction between cognitive processing and emotion in other intelligent species, such as elephants, may provide clues to human medical disorders, such as autism, depression and addictions. The mushara field site has provided an important environment to document examples of emotion based on known individuals and known social conditions as well as accompanying hormone profiles. The Oakland Zoo has served as an important laboratory for this research by providing a controlled environment within which to test some of the scientists’ theories that were developed in the field. So far, one captive elephant has been trained to participate in target training tasks within experiments relating to acoustic and vibrotactile acuity and cognitive ability in order to test for and further understand what postures and behaviors are attributable to distinct psychological states. These long term studies have resulted in numerous scientific publications and popular articles as well as the internationally acclaimed book, The Elephant’s Secret Sense (Free Press, 2007). Dr. O'Connell-Rodwell co-authored a children's 2012 Sibert Honor Book; for Houghton Mifflin’s Scientists in the Field Series, entitled "The Elephant Scientist" (Summer 2011), as well as an elephant photo book, entitled "An Elephant's Life" (Lyons Press, Fall 2011). This research was initiated by Utopia Scientific co-founder, Dr. Caitlin O’Connell-Rodwell and as of 2004, the program accepts a number of contributing volunteers in order to help educate the public on the importance of elephant conservation, which in turn serves to facilitate the cost of running the field program.